As many of you saw last week there are celebrations galore happening leading up to the start of the final episodes of Mad Men. Unfortunately not all of us live close enough to those festivities to participate. That’s okay though, it just means you will have to throw a party of your own. You can have a party in anticipation of the final episodes or throw a viewing party on April 5th to kick off the last episodes. Another option would be to throw it the day the last ever episode airs. The good news is that no matter when you decide to throw your party you still have time to plan and prep so your Mad Men party is the swankiest bash in town! The Drinks – We list this first, well, because let’s be honest, this is Mad Men and really the drinks are probably what is most important. You will want to make sure you research cocktails from the 60’s and have all the liquor, mixers, and extras (like bitters) on hand to be able to make some of the most popular classic cocktails. Think Old Fashioned, Dirty Martinis, Vodka Gimlets, Whiskey Sours, Brandy Alexander’s and of course Champagne Cocktails. Check out the guide AMC has here for more ideas and recipes. The Food – Next you will need food, once your guests have consumed a few cocktails they will need some hors d’eovres to munch on in order to stay classy :). The best news is by serving food that is classic to a 1960’s party you can make things ahead and minimize your time prepping the day of the party. Think about serving foods like Pimiento Cheese spread on Ritz Crackers, Deviled Eggs, Pigs in a Blanket, Shrimp Cocktail, Meatballs, and Fondue with crudités. The Décor – Be sure to class your place up a little and set the mood right. If there are modern things you can hide and put away do it. Put out a record player, a typewriter, or anything less modern to decorate the space. Pull out old books and pick up some vintage magazines at a thrift store to set out. Really take people back in time. If you have the time and the budget search thrift stores for vintage glassware to serve your drinks in and maybe even a swanky vintage bar cart to display all the libations. 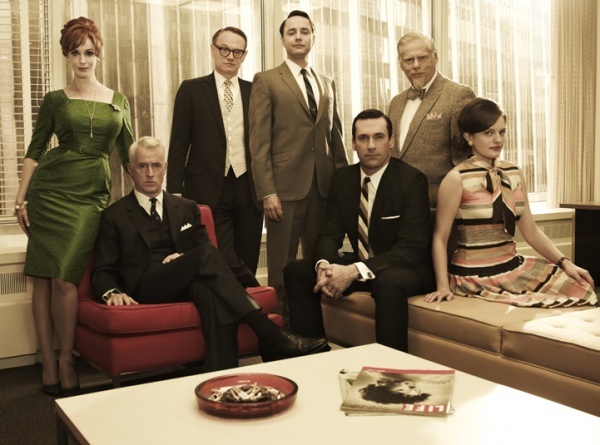 The Music – When you are not watching Mad Men on TV then set the mood with great music from that era. Think Frank Sinatra, Dean Martin, Ella Fitzgerald, some “Zou Bisou Bisou”, and The Beatles. Looking for more ideas for your tunes, check out the list AMC provides here to get ideas and a link to the official Mad Men CD soundtrack. You can also check out the Ultimate Mad Men Playlist from Rolling Stone over on Spotify here. The Dress – Have fun with the attire for the evening and have all your guests dress the part as well. Men can come dressed in their best suits and sporting fedoras a la Don Draper and the women can decide if they want to be a Betty, a Peggy, a Joan, or a Megan. The best way to do this is to decide which characters style you would like to steal for the night, search images and then head out to thrift and vintage stores in your area to get the look. And if you are the hostess of this party make sure to get yourself a great vintage apron to really play the part. Remember the Evening – Lastly make sure to take lots of pictures to remember this evening and how classy you and your friends can be when you really try. Pick some of the photos of the cast and pose as a group recreating them. 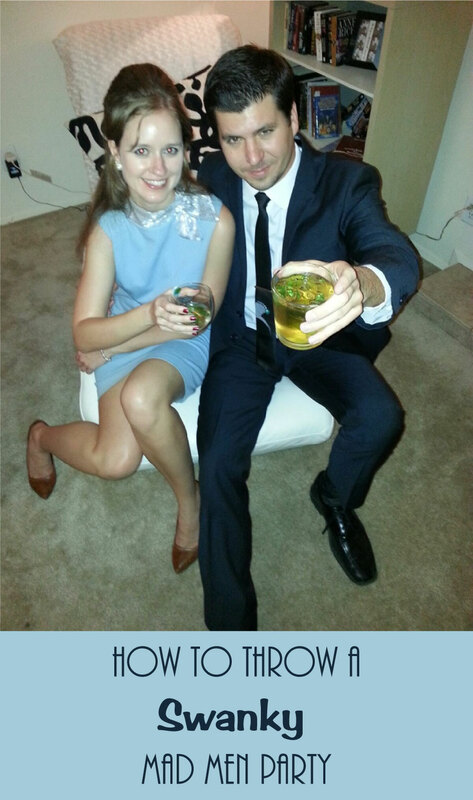 It will be a great way to remember your party by and is the way to get some very Mad Men style group shots.